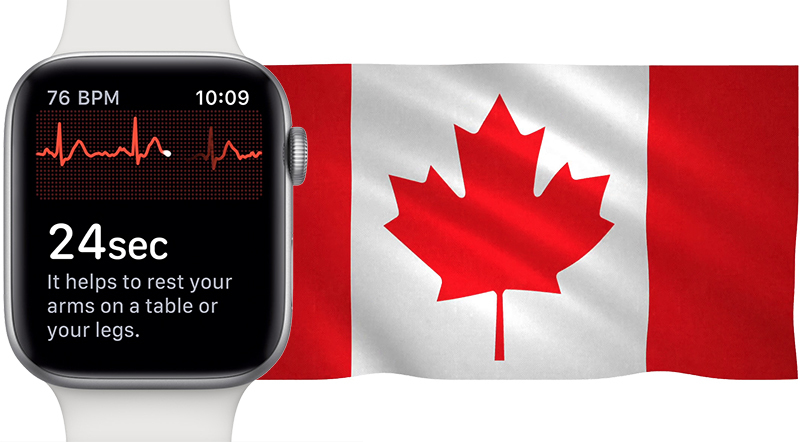 Apple says it is working with Health Canada to bring the Apple Watch Series 4's all-new ECG functionality to the Canadian market, according to MobileSyrup's Patrick O'Rourke. No timeframe was specified. This likely means that Apple has submitted an application with Health Canada for clearance to sell the Apple Watch Series 4 with the ECG functionality enabled. Health Canada has similar requirements as the FDA in the United States for medical devices to be sold in the country. In the meantime, Apple says the ECG functionality will be limited to the United States, where it has received clearance from the FDA. However, the ECG app for watchOS 5 won't be available until later this year. Apple Watch Series 4 models include a new electrical sensor on the rear that's designed to take an electrocardiogram using Apple's ECG app, the built-in sensor, and the electrode built into the Digital Crown. This allows the Watch to display a single-channel ECG, similar to a Lead I ECG, according to the FDA. As a potentially life-saving feature, Apple surely wants the ECG functionality to be available in as many countries as possible, so it's likely the company is working with public health agencies in other countries too. Why can't they just enable it with a disclaimer "This is not legally a medical device." in the countries where it doesn't have approval as a medical device? Don't think it's anything to do with the NHS - Apple will be trying to get EU approval at which point it will have been approved throughout the EU. Which had better happen before the end of March 2019 or it will be down to the useless UK government who will debate it for 20 years. I doubt UK (NHS) will sign up for this in a hurry, but I personally would welcome it. Take up of AW4 could be more subdued in countries were this key feature is not implemented. If so, they better hurry up and do it before March 19.
in my honest opinion, there are significant downsides to having too much insight into one's physical health.